Here’s wishing all celebrants a Happy Deepavali. To those driving back to hometown, please drive safely. Since there is also another public holiday this week- many are taking the entire week off. Have a great celebration and happy holidays to all. A time for rejoice and renewal as a celebration of truimph of good over evil and light over darkness. Traditionally celebrated by lighting of oil lamps and houses are beautifully decorated with colorful Kolams. Kolams are displayed as a sign of welcome to prosperity and blessings. Peacocks are commonly used in Kolam as symbols of beauty, glory and refinement. Vibrant colored rice is used to form the Kolam to achieve the desired hues and vivid vibrancy. 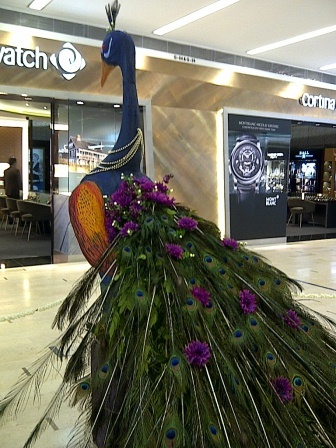 Embracing creativity in tradition, the significant motif of peacock is used and drawn in bright attractive hues. Taking a creative twist, the Kolam is infused with colourful Indian spices such as curry powder and tumeric power. The peacock feathers are interlaced with purple flowers. Very creative design and both caught the eye of shoppers immediately. 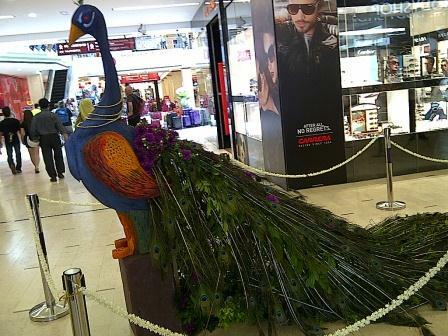 The peacock is the National Bird of India and is closely related to Hinduism as the vehicle (vahana) of Lord Muruga. 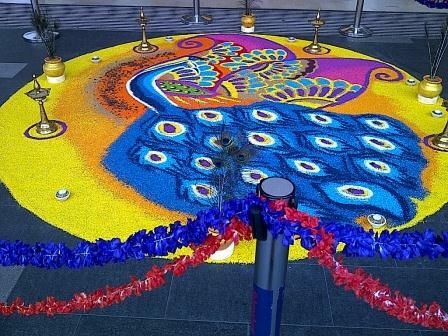 Most of the malls have opted for the ever-popular peacock kolam, a design that has made a comeback after two years. The kolam is a form of sandpainting art designed using either rice flour, rice or sago. It is usually drawn at the entrance of Hindu homes to welcome the Hindu goddess of fortune, Lakshmi. 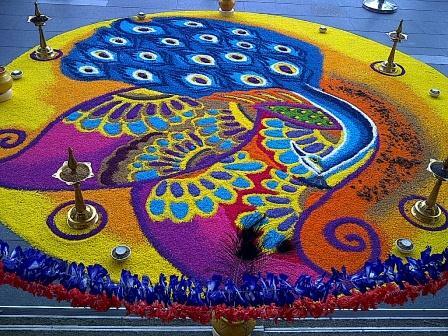 The traditional rice flour kolam uses simpler designs while the rice grain kolam, or better known as the Rangoli Kolam, is more elaborate with bright hues that are designed to capture the audience’s attention.